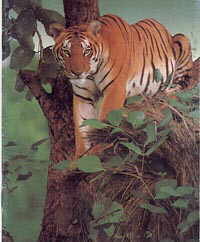 India Wildlife, Wildlife in India, Indian Wildlife, Wildlife Tours India, Indian Wildlife Adventure, India Wildlife Tour, Indian Wildlife Tour, India Wildlife Travel. India a unique subcontinent has vast variations in geography, climate and vegetation. As a consequence there is exciting diversity in habitats and wild life. The mighty is Himalayan is the highest mountains in the world; offer a wide spectrum of landscapes and wild life. Tropical forests in its extremity contrast with the pine and coniferous woodland of the western Himalayans. Natural cover varies with altitude and these evergreen forests are bounded with high alpine meadows nearer the snowline and temperate forest of short stout trees in the lower elevations. In the foothills are deciduous trees, with shrubs, bamboos. Fern and grass. The northern plains. The course of the holy rivers Ganga and the Yamuna, the Great Thar Desert in the west, the Sundarbans, the marshy swamplands, in the delta of the Ganga and the Brahmaputra, in the east; the ancient volcanic rock of Deccan Plateau, lying in the rain shadow of the hills and the western Ghats with their dense, luxuriant forest - all provide fascinating variations in habitats. These sustain over 350 species of mammals' 2, 100 kinds of birds - local and migratory, nearly 350 species of reptile and countless insects. The need for conservation of the environment and the forest has exercised the minds of Indian rulers from the earliest of times. In the 3rd century BC, the Emperor Ashoka issued edicts to protect forests and natural wealth. Later during the region of the Emperor Chandragupta Maurya, "forests free from fear" were identified and protected. In more recent times, it was the administration and princely rules that demarcated and reserved forests as private preserves. Today many of these form the nucleus of India's wildlife sanctuaries and parks. The demands of rapidly increasing population continue to put pressure on surviving forests in India. Vast herds of black buck, that roamed the northern and western plains 50 years ago, are now found only in sanctuaries and around the villages of the Bishnoi tribe, who protect them. The Project Tiger initiated in 1973, is today a massive attempt at the conservation of the tiger and its total environment. It covers 23 National Parks and Sanctuaries and its success can be gauged from the fact that the number of tigers in India has gone up significantly since the project was launched. India, currently, has around 80 National Parks and 441 Sanctuaries dotted around the country. While some are inaccessible many have excellent facilities for visitors. Depending its own excitement. It may be done from elephant - back, from watch towers or even a boat - and the thrill of spotting herds of wild elephant, deer, a rhino or even a tiger, in its natural environment, is very difficult to match.